This month, I am again featuring a collection of art rather than an artist. A little while ago, a major collection of American Indian pottery was given to me to resell. I featured it on this website, and sales were so successful that we've received a second group of pots from the same collectors. The grouping expresses a wide-range of Pueblo pottery including, of course, Hopi and Zuni, contemporary, historic and even miniature pieces. It represents over 20 years worth of efforts, scouring the most elite auction houses and the offerings of the best dealers. 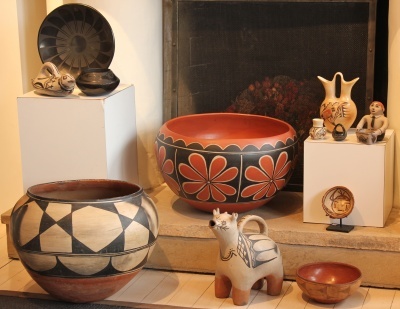 The result is a comprehensive selection of fine Southwestern American Indian pottery representing some of the most outstanding pieces available along with others that are important to round out any collection. Fortunately for my current clients, the owners of the collection have decided that they are ready to move out of the pottery arena, and instead allow others the chance to carry on the tradition. Therefore, the owners are simply interested in selling the pieces rather than achieving the highest possible price for them. In fact, they kept meticulous records of the prices they paid, and in order to ensure quick sales, they have agreed to offer the pottery for prices below what they paid even twenty years ago. Needless to say, there are some real bargains to be had here. I have added thirteen additional pieces to offer for sale on our website. There are some superb vessels from a fully intact historic Cochiti animal to a Polacca ladle bowl collected on the Wheeler Expedition. Others vessels are by important potters such as this Tonita Roybal black feather plate. Besides a few miniatures like this Frogwoman polychrome jar, there's even three very different Santo Domingo dough or food bowls. One is an old 1920's Santo Domingo Dough Bowl , another is a more contemporary Arthur and Hilda Coriz Dough Bowl, and finally the steal of the collection is an Ernestine Calabaza Aguilar Bowl for only $150. That's right. $150! All of the pieces are priced right, though. The collection is in excellent condition. It was acquired in great condition, and it has been very well cared for. The material is also quite fresh since it hasn’t been on the market for years. I hope you are able to take advantage of this very special offering. 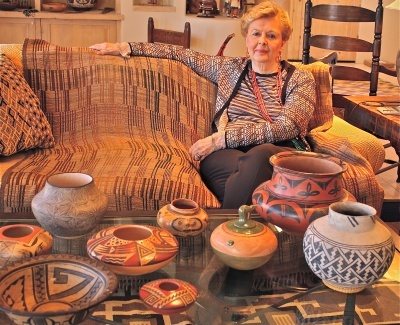 View videos of Marti introducing Pueblo pottery from part 1 of the collection including Marti Struever with Zuni Frog Jar, and Mari presenting other Pueblo pottery items like a Lucy Lewis jar and a San Ildefonso jar. View what is left of American Indian Pottery Collection #1 here.